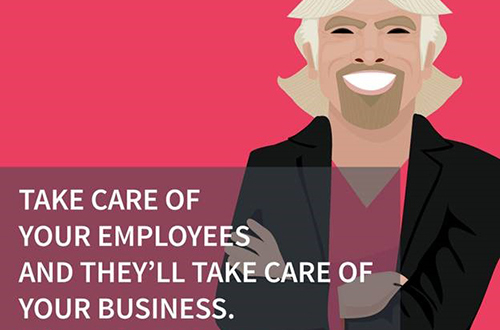 – Says Richard Branson, Founder of the Virgin Group. Wise words, wouldn’t you say? This principle – taking care of your people – is at the heart of creating a great place to work, where people are appreciated, engaged, productive and thriving. Where they actually want to work. That’s why we’re seeing leading employers worldwide increasingly investing in their workforce’s wellbeing. Why does this matter? Because over 70% of employees in the US are disengaged, according to Gallup Research, costing businesses billions in lost productivity annually. Globally, those numbers climb even higher. That may seem a bit doom and gloom, but it’s actually not, which is exactly why it’s such an exciting time for the employee engagement and wellbeing industry. Gone are the days when companies viewed employee engagement and wellbeing programs as ‘nice to do,’ yielding ‘soft’ benefits. Companies with high engagement scores perform better than their counterparts in key operational areas like productivity, absenteeism, turnover, safety and quality incidents, shrinkage, customer metrics, and profitability. CEOs care about and are measured against these numbers, so it’s no wonder they’re launching initiatives aimed to boost employee engagement. In fact, “increasing employee engagement” is the number one strategic priority for CEOs. But there’s room for improvement in how companies go about it. Research on employee engagement and productivity continues to show the basic health of employees indicates how engaged they’ll be on the job. Yet today, taking care of ourselves isn’t always top priority. Think about it: when asked to do more with less, be accessible 24/7, and respond to emails the moment they hit our inboxes, we sacrifice our personal priorities to do so. We’ll put healthy habits – exercising, eating healthily, getting enough sleep – on the back burner because we’re squeezed for time, overwhelmed, and stressed out. The result? Disconnected workforces that feel unappreciated, and can’t engage in the first place. To drive engagement, we’ve got to put employees in the driver’s seats of their own lives. Progressive employers know this. And it’s moving to see them take an innovative, holistic view of their workforce, ditching ‘check-the-box’ programs, and realising that taking care of employees goes beyond saving on healthcare costs. Healthy, engaged employees are your top competitive advantage. No matter how good your business model is or products are, you still need a stellar team to design, build, improve, sell and service them. How? By supporting your people across all aspects of life to help them be their best selves. Once employees feel great and have the support they need, they’re better able to engage, be more productive, and thrive – on and off the job. By taking care of your people, companies create a workforce with the physical energy, mental focus, and emotional drive necessary to power their businesses and impact those critical metrics.